Poems by Alain Suied, from Le Pays perdu. I. 6 mn – II. 4 mn 30 s – III. 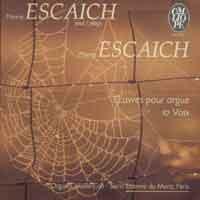 2 mn 30 s.
• World premiere: 18/10/1998, Saint-Vigor Church, Marly-le-Roi (France), Jeux d’orgue en Yvelines festival – Thierry Escaich (organ), ensemble vocal Soli Tutti, Denis Gautheyrie (cond.). • Commissioned by ensemble Soli Tutti. Composed in 1998, based on three poems from Alain Suied’s collection Le Pays perdu (The Lost Country), the Three Motets are the result of a commission by the Soli-Tutti Ensemble who premiered them in October the same year in Marly-le-Roi, conducted by Denis Gautheyrie – I was at the organ. They were then adapted for organ solo in 2002, and called Poems. As is often the case in my vocal pieces, in Motet I, the melody, the rhythm and the spatial distribution of the various thematic elements are determined above all, by the images evoked by the poem. To that are added outside elements – in this case, the Gregorian antiphon Puer natus est nobis (A child is born to us) – which enable me to intensify certain images from the poem and create a sort of literary counterpoint. These words about the Nativity are recited to an unchanging and slightly irregular rhythmic rocking motion, swaddled in the soft, bright flow of the poem (for solo soprano and bass). The two progressions in the intensity of the piece convey, firstly, the image of the ‘birth-waters of the universe’ (with an arpeggiated flow of foundation stops and a canonic confusion of voices, then, shortly after, the progressive rise in ‘the warmth of a cry’, where the initial rocking motion evolves, in the form of a short organ toccata, before losing strength and descending once more into the silence and mystery of the Nativity. In the version for organ solo, this piece is called Eaux natales (Birth-Waters). The Motet II is a stronger dramatic piece. It could have been entitled The Gaze of Death. In its version for organ solo, it will be called Le Masque de la mort (The Mask of Death). A series of chords, fortissimo, express each syllable of the poem in ‘chops’, as if an icy blade were irregularly, inexorably punctuating the silence. The Latin text providing a counterpoint (as in Motet I) to the poem by Alain Suied, is that of the psalm De profundis, “I was calling you from the depths my Lord...” which transforms the piece into a sort of hymn of entreaty. Once again, the organ provides more than a simple accompaniment to the choir, responding in a style close to that of the double choirs of the Renaissance, creating various sorts of propulsive movements, or adding high or low textures to the vocal layers with the aim of bringing out the spatial dimension of the writing. As in Esquisse IV, the words of Motet III express a frantic attempt to escape death, but this time the driving force is Hope. 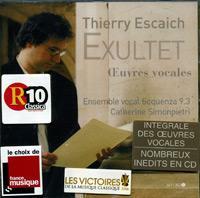 Vers l’espérance (Towards Hope), that is the title of the adaptation for organ solo. And as for the final question, it is an appeal to the Creator. My choice of the text of the Kyrie eleison, “Lord, take pity”, to bring out the mystical meaning of this piece is therefore quite logical. Apart from the almost constant superposing of the two languages (Greek and French), and hence the frequent superposing of different layers of sound as if the vocal ensemble were treated in an orchestral way, the dominant feature is the dance. A sort of ritual dance, with a constantly irregular and ever-changing rhythm, based on the motets ‘mesurés à l’antique’ of a composer such as Claude Le Jeune, as well as on certain types of extra-European – or quite simply modern (e.g. rap) – music. The text submits itself to the most diverse accentuations, aimed at giving it an internal rhythm that will bring out the suspenseful character of the poetic phrase. Swaddled in contemplation, the infant’s eyes take in the story of this world. Flesh and cloth: in the folds the source of all our dreams is perceived and corrupted. The heart’s crystal collects the birth-waters of the universe. Awaken to the first silence of contemplation. When everything is given to us inadvertently, in the warmth of a cry. The world has just been born, if you reach out to it. The impenetrable gaze of Death, the mask without contours, one day we shall face it, one day it will mark us out. It will be a voice, a weary desire, a cry, a colour: you never know. It will be the unhappiness of a child or the rustle of a ghost, and suddenly, our eyes burned by its forbidden presence, we shall recognise its summon among all summonses. What hounds us and twists us and deceives us beneath our masks? What suffers and rebels deep down inside us, despite our dreams? Who are you, sad, silent matter? Of what region of heaven are you the forgetful messenger? Of what distress are you the unfathomable abyss? What bears us up and calls to us and raises us above ourselves, in hope?